83 A Cordiall for wind in the Stomack Take six or eight spoonfuls of penny royall water, put into it four drops of oil of Cinnamon do drink it any time of the day so you fast two houres after. For any gripings of the belly take a pint of claret. 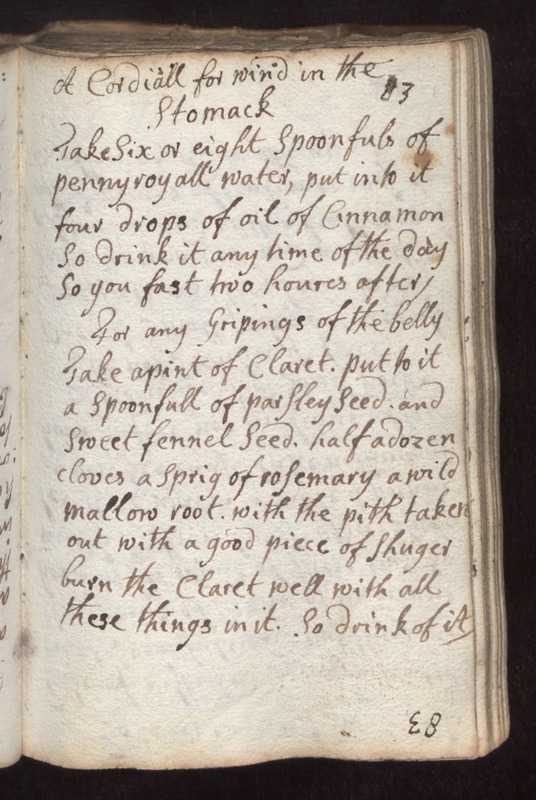 Put to it a spoonful of parsley seed and sweet fennel seed, half a dozen cloves a sprig of rosemary a wild mallow root with the pith taken out with a good piece of shuger burn the Claret well with all these things in it. So drink of it.